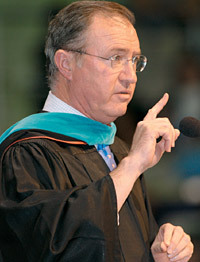 Glenn F. Tilton, president and CEO of UAL Corp., at the full-time and TMP commencement where he addressed the graduates. Though economic times are more uncertain today than when students left the work force to earn their MBAs, commencement speakers advised the Kellogg School's Class of 2003 that the trials they face will ultimately make them stronger leaders. Convocation speaker Glenn F. Tilton, chairman, president and CEO of UAL Corp. and its subsidiary United Airlines, noted that graduates will re-enter a weak economy where unemployment remains high. "Combine that with a threat daily of terrorism and you're facing one of the most uncertain times in history," Tilton said. In all, more than 1,000 students received master of business administration, doctor of philosophy or joint master's degrees in business and another discipline during the graduation ceremony, held June 21 at Northwestern University's Welsh-Ryan Arena. Tilton, who comedian Jay Leno once quipped had the worst job in corporate America, offered lessons from his tenure as CEO of an organization facing financial challenges. "A challenging environment is a good thing," Tilton said. "Success can come too easily in a boom economy. What you gain from challenges is a sense of appreciation for accomplishments, not a sense of entitlement." It seemed a fitting send-off for the Class of 2003, many of whom began their studies at the Kellogg School on Sept. 11, 2001 ó the date of the terrorist attacks on New York and Washington, D.C. ó and have witnessed the country's steps to recover its economic footing ever since. There is no one path to success, said Tilton. He advised graduates to take risks, be open and honest and to refrain from taking themselves too seriously. "Be humble. In your jobs, you will be encountering people from all walks of life and I believe you can learn from all of them," he said, adding that he reads every email message he receives from his employees. Kellogg Dean Dipak C. Jain advised graduates to make continuous learning part of their careers and not to forget to turn to their alma mater in their quest for additional knowledge. 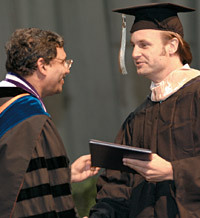 "Learning should still be your guide as you move forward," Jain said. 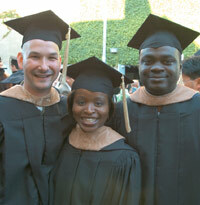 "Turn to the Kellogg School as a source to replenish your mind, body and soul." Also during the two-hour ceremony, Assistant Professor of Marketing Christie Nordhielm accepted the L.G. Lavengood Professor of the Year Award for outstanding teaching. Saying fear can be a motivating factor in marketing, in the classroom and life, Nordhielm told graduates to face head-on the things that test them. "Fear is one of the first signposts on the road to learning," she said. "Don't turn away from difficult problems, whether at work, in your personal life, or most importantly, in the world."